If you enjoy a quiet story about friendship then look no further. The only thing Joe and Ravi (rah-VEE) have in common is they’re both starting fifth grade. Joe is labeled with an Auditory Processing Disorder. It means too many words can overwhelm him. He gets help from Miss Frost, the resource teacher, and would just keep to himself if it weren’t for his nemesis, Dillon the bully. Ravi is new to Hamilton, New Jersey having moved there with his family from far away India. Back home he was popular, the top of his class, and in control. In America he is laughed at and misunderstood. Told in short alternating view chapters, the two boys barely notice the other exists. Then the unkind ways of Dillon slowly bring them closer until a final epic event changes their understanding of each other. Brought forth clearly are the assumptions people will sometimes make about others based solely on a person looks or how they act. The ending though made me smile. FULL PLOT (From Amazon) Joe and Ravi might be from very different places, but they’re both stuck in the same place: SCHOOL. The internal thoughts of Joe and Ravi put you solidly in their corner. They not only have problems at school but their protective families also provide them each with challenges. Learning about the culture of India–their customs and food. A great demonstration of how hard it would be for someone from another country so different from the USA to move and settle here. The post story part of the book includes a glossary of words Ravi and Joe each use. There are also two recipe’s for their favorite things to eat. For Joe it’s apple crisp and for Ravi we get Indian cookies known as Naan Khatais. The ingredients for each are delicious sounding and the dishes are easy to make. Great book for classrooms that may also be filled with diverse backgrounds. Read it out loud and savor the discussions that would follow. The five days in these boys life is set with the backdrop of the school lunch offering. A perfect structure for the telling of this peaceful story. “Is it vegetarian?” asks Amma. I decide not to tell them about the chicken fingers. AUTHOR QUOTE (From Sarah’s web site): One thing that I am especially proud of about our story, and one which I think sets it apart from others, is that over the course of five days, Joe and Ravi become friends without ever having exchanged a word. 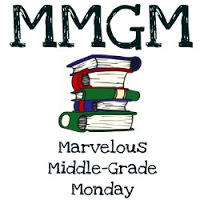 This entry was posted in Reviews and tagged Gita Varadarajan, male protagonists, Marvelous Middle Grade Monday, MG book reviews, Middle grade, Middle Grade Diversity, Sarah Weeks, Save Me a Seat. Bookmark the permalink. Both Joe and Ravi sound like such interesting characters. And having been to India, I love books that tell about the culture. Thanks for sharing this. This sounds pretty interesting. We are getting more books with diverse characters all the time, and that’s great. Thanks for the heads up. I will check this out. I had a good laugh with that excerpt. Chicken fingers! This dies sound interesting. I’m always on the lookout for good realistic fiction that boys would like and friendship is a big thing with them. I meant, “This DOES sound interesting.” Oops!